UPDATE: I tossed the pattern. I’m not happy with the skirt, either. I’d rather DD had something that hung more evenly. 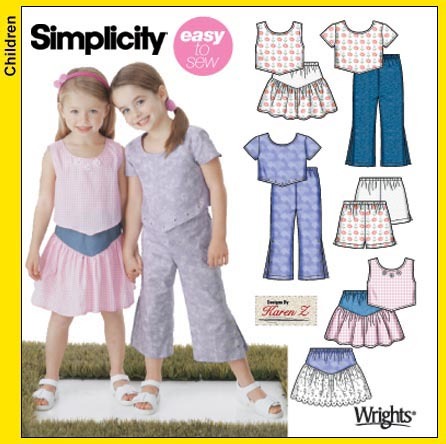 Girl’s summerwardrobe for wovens, consisting of a t-shirt, tank top, cropped pants, shorts, and skirt. An interesting design detail is the pointed front on the tank top and the yoke of the skirt. I made the t-shirt, tank top, and skirt. Children’s 3-8. My daughter has a waist of 20 inches; that’s my only current measurement for her. She’s slender, and like other Simplicity patterns, this one fits her well. I used a size 4. Yes, but (see the next section). LIKED: I love the pointed detail on the skirt. I bought the pattern for the skirt. LIKED: The skirt came out well. DISLIKED: The neck opening is just barely large enough to get her head thru. And this is why I marked this pattern “would not recommend”. According to the CDC chart’s DD’s head is average for her size. That means that the neck opening is in all probability too small for most kids. It needs a placket. DISLIKED: There is too much ease in the sleeve. I’ve read discussions on how much ease should be in an adult’s sleeve, but I’ve never seen one for children. I wish there was a book called “Fashion Industry Secret’s for Children’s Clothing” which had the same information for those small patterns. DISLIKED: The instructions have you put the sleeve in in-the-round. I should know better. I’ve put in enough sleeves in very small items to remember to put them in in-the-flat. It’s just extremely difficult to manipulate that very small opening. I can’t do it without stabbing my self with pins, and I have a terrible time keeping my easing smooth and unpuckered while I’m sewing the sleeve in. I think the instructions should have you do construction in the flat on these small garments. DISLIKED: The neck facing. I dislike facings in general. I used a bias tape pulled to the back instead. Some of that eyelet from her Frilly Dress. Bias tape instead of neck & armhole facings: I cut bias the (seam allowance distance)*2 plus some extra which is (5/8 1/4)*2 extra = 1 3/4 1/4 = 2 inches. Because bias becomes narrow when touched and because some of that material is used in the fold, I add the extra. The 1/4 inch is arbitray; 2 inches is easy to cut. Shape the bias tape at the iron before applying; I forgot to do this on one, and the neckline funnels. 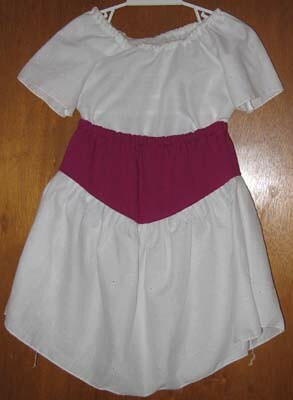 I used rolled hems on the sleeves and skirt bottom. I lined the yoke because the pink fabric dd chose is scratchy. I left one side seam open at the top to insert the elastic. The pattern called for a casing that was 1 inch wide for 1/2 inch elastic. I used 3/4 inches for 1/2 elastic. I might make the skirt again. I like the pointed yoke, but I like the skirt fromSimplicity 5689 almost as much, so I’m debating just tossing this pattern. I definitely recommend against other’s getting this pattern, and be sure to watch out for neckholes like this. I’m sure I could add a placket, or you could, but why, when there are existing patterns that would work. Neckhole is too small to be a wearable top.